Remember Zuma? The fast paced and super addictive tile or balls matching puzzle and match-3 video game? With amazing and quite catching sequels named Zuma’s Revenge, Zuma Blitz and Zuma Deluxe, Zuma sold millions of copies and received Game of the Year award back in 2004. 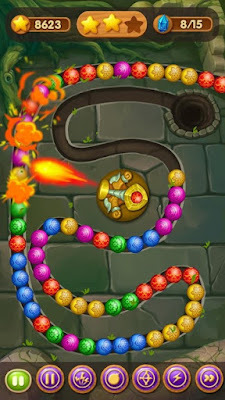 The game features an addicting and engaging game-play, adventure and gauntlet gaming modes and a lot of colored balls to match. The game-play is quite simple and easy, Player hits the balls of the same color and scores points and he must not let the balls reach to the center, or he’ll lose a life. If you want to go back in time with your own Android smartphone, check out the game we chose for you today! The game that we’re sharing with you today is called Marble Puzzle: Marble Shooting & Puzzle Games. It is a delightful marble quest experience for Android users of any age, offering a wide range of challenges, hard missions, beautiful graphics and much more. To learn how to play, keep on reading and see what the gameplay’s all about. Marble Puzzle is a marble blast puzzle that will definitely tease your brain and at the same time, relax your nerves. The main task on this game is to shoot the marbles and blast them. Aim directly at the ones you want to shoot and tap on the screen where you want to shoot. You will have to shoot at least 2 of the same colored marbles to blast them. This is how you earn your points. If you make combos and make chains, you will win higher scores. In addition, you can use various power-ups when you need some help. Providing with over 150 challenging levels and optimized for both phones and tablets, Marble Puzzle: Marble Shooting & Puzzle Games can be downloaded from the Google Play Store. Get it today and play it for free!